There are two and possible more accounts as too how Eggs Benedict came to be a sought after breakfast and Sunday brunch item. The first account is from 1894 when Lemuel Benedict, a Wall Street broker, went into the Waldorf Hotel to get something to eat in the restaurant. It was said he had a hangover at the time. He ordered some toast, crisp bacon, two pouched eggs, and a side of hollandaise sauce. A column in The New Yorker – Talk of the Town – had interviewed Mr. Benedict just before he died, in 1942. During the interview he had made the claim that he had put the dish on the breakfast and luncheon menu of the Waldorf Hotel. 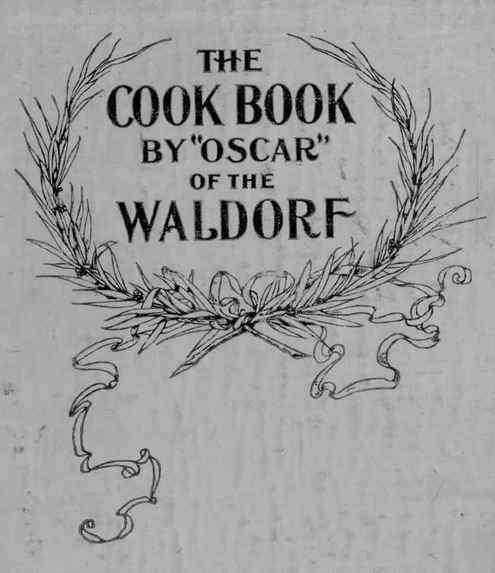 Mr. Benedict even claimed the Eggs Benedict recipe was published in the cookbook – Cookbook of the Waldorf (author Oscar Tschirky – printed 1896) because of him. The second account is from 1967 when a claim was made by Edward P. Montgomery on behalf of commodore E.C. Benedict, as he wrote a letter to the New York Times, that included the recipe. In the letter he claims to have received the recipe from his uncle, a friend of the commodore. There have been several different ways to make Eggs Benedict since its appearance to the culinary world. 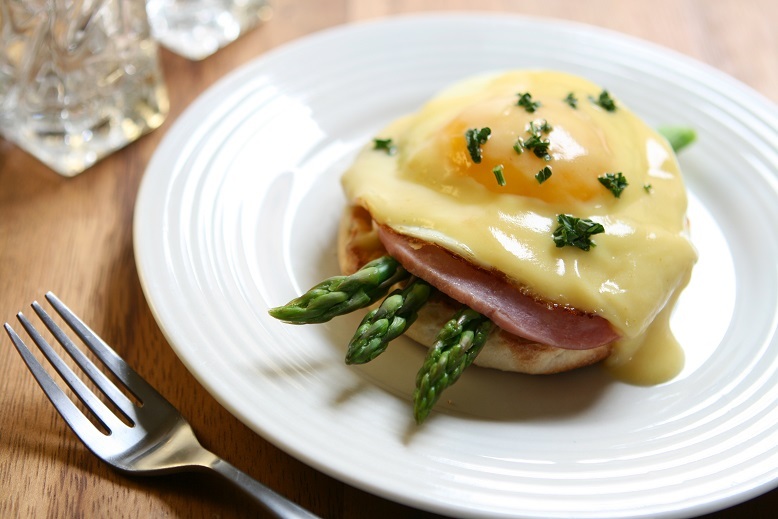 Most of us know it is an American breakfast dish that consists of two halves of an English muffin, topped with ham or bacon, poached eggs, and Hollandaise sauce (see our recipe here of Eggs Benedict with Hollendaise Sauce). Here is our version of Eggs Benedict, though several may have made it in their kitchen before we did. We call it Bacon Eggs and Asparagus Benedict. In large pot of boiling salted water, blanch asparagus until tender-crisp, about 2 minutes. With slotted spoon, transfer to bowl of ice water; drain and pat dry. In a 6 quart pot add water 1/4 way up. Bring water to a soft boil. Add yolks and lemon juice to either a large glass or metal mixing bowl. Place the bowl over the pot of soft boiling water and start to whisk the yolks over the simmering water until yolks become thick, about 2 to 3 minutes, removing from heat and putting back on. Do not stop whisking. Remove from heat and add butter and whisk in. Next add sea salt and pepper to taste, whisk some more. If the sauce is to thick just add a few drops of water until you get a sauce again. Using the same pot of water add 2 to 3 teaspoons of white vinegar. Next crack an egg into a small glass bowl and gently drop egg into boiling water for 2 minutes. Do this with each egg. Remove pouched egg with a slotted spoon and place one egg on each slice of muffin. Place 1 or two slices of the toasted English muffin on a plate. Next add 3 or 4 asparagus spires, then add ham, poached egg, and spoon on sauce. This entry was posted in Breakfast and tagged 1939 New York World's Fair, Agaricus bisporus, Antoine's, Béarnaise sauce, Benedict recipe, Egg yolk, Eggs, Eggs Benedict, Eggs Sardou, English muffin, Florentine Eggs, Hollandaise Sauce, Lemuel Benedict, New York City. Bookmark the permalink. What a delicious breakfast or lunch. Yes it is Jovina 😃 thanks for stopping by and I hope you have a great weekend. I so want one of these RIGHT NOW!! !